Federal budget cuts not only grounded the return of SkyFest in 2013, they also put the kibosh on what was to be Maj. Joshua Boudreaux’s first of two years with the Air Force’s Thunderbirds demonstration team. “Any pilot who’s grounded feels like a little part of them dies,” said Boudreaux at Fairchild Air Force Base on Thursday, standing in front of the F-16 jet he’ll fly this weekend during the return of Spokane’s once-annual air show. Fairchild officials canceled the expected return of SkyFest last year when the Defense Department announced the Thunderbirds would not be traveling as a result of sequestration. On Thursday, members of “America’s Ambassadors in Blue,” as they’re known internationally, arrived in Spokane after a year’s delay, with the assist of Fairchild’s signature aircraft. 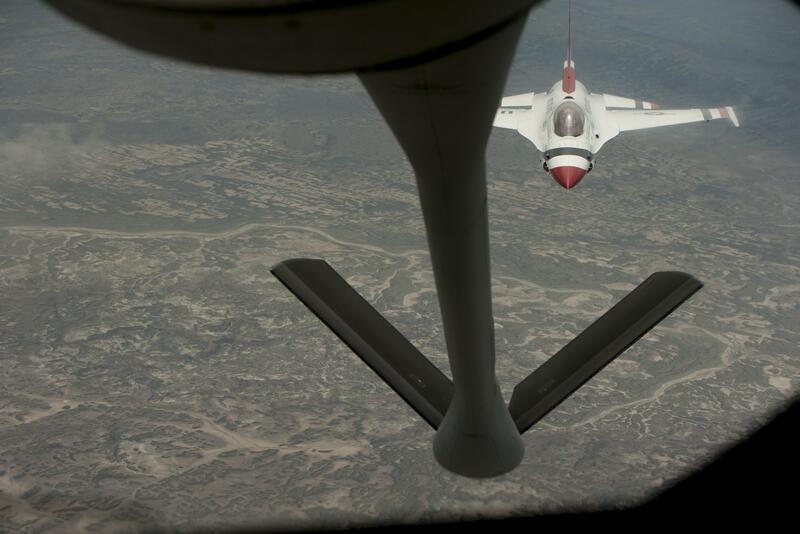 High above the Colorado mountains, the six-member Thunderbirds team met up with a Fairchild crew in a KC-135 Stratotanker for fuel Thursday morning after a flyby of the Air Force Academy grounds. In the rear of the now nearly 60-year-old tanker, Senior Airman Cameron Bilyeu, of Portland, lowered the refueling boom using a pair of joysticks, a mirror and computers to each of the fighters waiting their turn. For Bilyeu, who has spent hundreds of hours operating the equipment, playing what amounts to a complicated crane game miles above the Earth’s surface with thousands of pounds of jet fuel has become routine. “I love it,” said Bilyeu, who has been at Fairchild for a little more than three years. At first, lying horizontally in the heavens, staring down aircraft just dozens of feet away with the ground far below, was “nerve-wracking,” he said, but now he can determine the tanker and its fuel recipient’s position by feel alone. On the ground, Col. Brian Newberry, commander of the 92nd Air Refueling Wing at Fairchild, said the return of SkyFest this weekend is a gift to the community that supports the base. “Spokane deserves to see American airmen telling their story,” Newberry said. For Boudreaux, who has seen stints in South Korea as well as part of the fighting force in Libya, that means displaying the technical skill of American pilots with maneuvers that require stopwatch precision.